Unique anti-pill fabric, taped neck seam, flat knit collar and ribbed cuffs side vent and razor sharp placket. School logo embroidered on left breast. 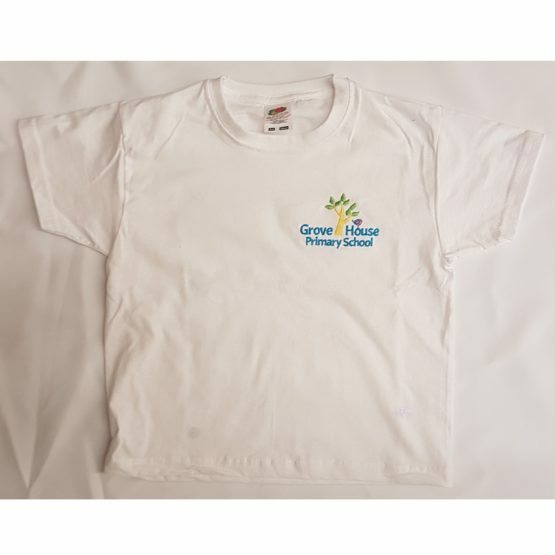 Colour white only available for all age groups at the school. Fabric :- Easy Care 65% Polyester / 35 % Cotton. Weight :- 200 - 210 gsm. Size age/Chest" :- 2/22, 3-4/24 5-6/26, 7-8/28, 9-10/30, 11-12/32, 13/34, Small/36, Medium/39, Large/43, XLarge/47. Please note that adult sizes are only suitable for young children under the age of 14 and therefore unsuitable for older people. White T-shirt Produced using Belcoro yarn for a softer feel. Full cut styling. Taped neckline for added comfort. Twin needle stitching detail on neck, sleeves and hem. School logo embroidered on left breast. 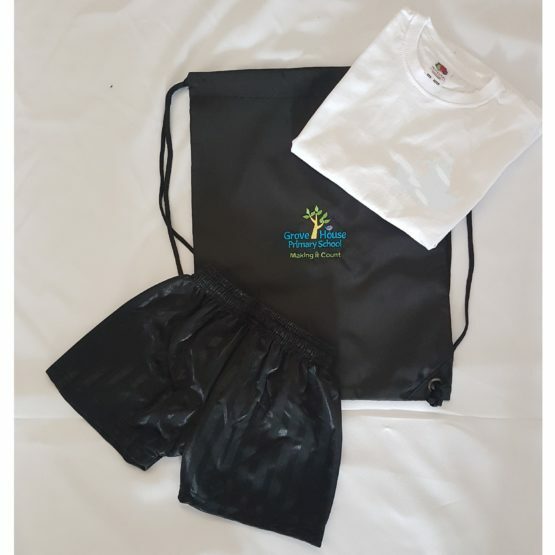 Black premium gymsac with school logo embroidered and navy shadow shorts with Elasticated waist. Size Year/Waist"/Chest":- 3-4/18-20/26 5-6/18-20/28 7-8/22-24/30 9-11/22-24/32 12-13/26-28/34, 14-15/30-32/36, Small/30-32/35-37, Medium/34-36/38-40. Please note that adult sizes are only suitable for young children under the age of 14 and therefore unsuitable for older people. 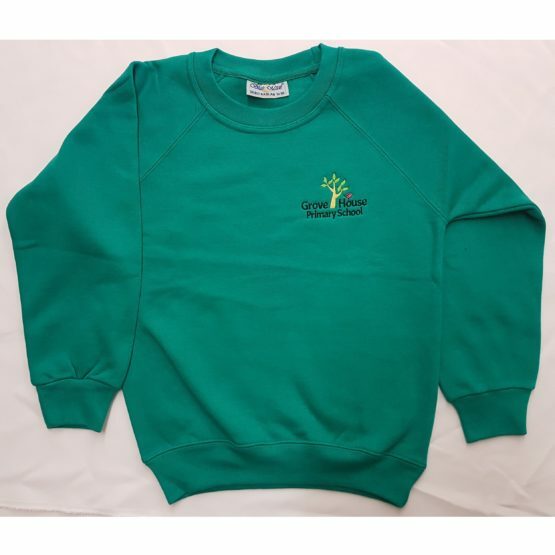 Raglan sleeve crew neck sweatshirt, ribbed welt hem and cuffs, twin needled seams, taped back neck seam and soft to handle, cotton rich durable fabric. School logo embroidered on left breast. 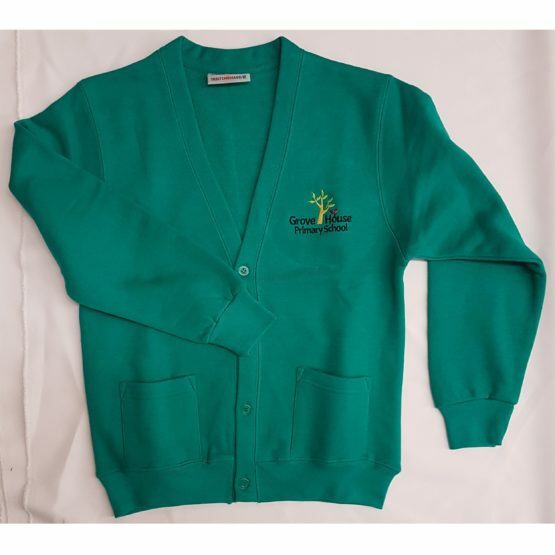 Colour :- Jade, only available for Nursery to Year 5. Fabric :- 65% Cotton / 35% Polyester. Washing :- 40º. Weight :- 320-340 gsm. Size age/Chest" :- 3-4/25 5-6/26, 7-8/28, 9-10/30, 11-12/32, 13/34, Small/36, Medium/39, Large/43, XLarge/47. Please note that adult sizes are only suitable for young children under the age of 14 and therefore unsuitable for older people. Drop shoulder sweat cardigan with ribbed welt hem and cuffs, twin needled seams and taped back neck seam and Soft handle cotton rich durable fabric. Two patch pockets and self coloured buttons. School logo embroidered on left breast. Colour :- Jade, only available for Nursery - Year 5. Fabric :- 65% Cotton / 35% Polyester. Washing :- 40º. Weight :- 320-340 gsm. 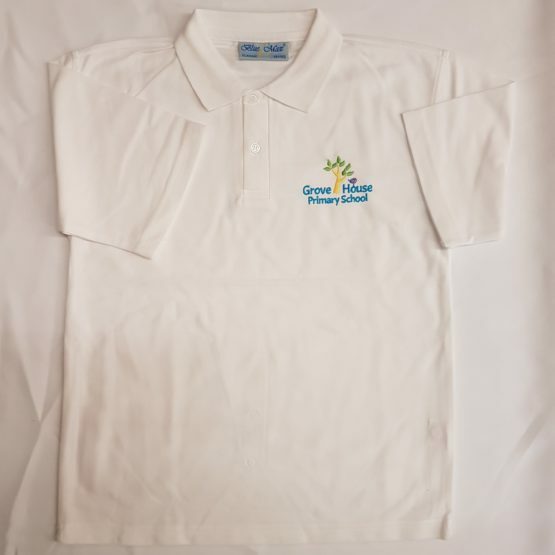 Size age/Chest" :- 2/22, 3-4/25 5-6/26, 7-8/28, 9-10/30, 11-12/32, 13/34, Small/36, Medium/39, Large/43, XLarge/47. Please note that adult sizes are only suitable for young children under the age of 14 and therefore unsuitable for older people. Drop shoulder sweat cardigan with ribbed welt hem and cuffs, twin needled seams and taped back neck seam and Soft handle cotton rich durable fabric. Two patch pockets and self coloured buttons. School logo embroidered on left breast. 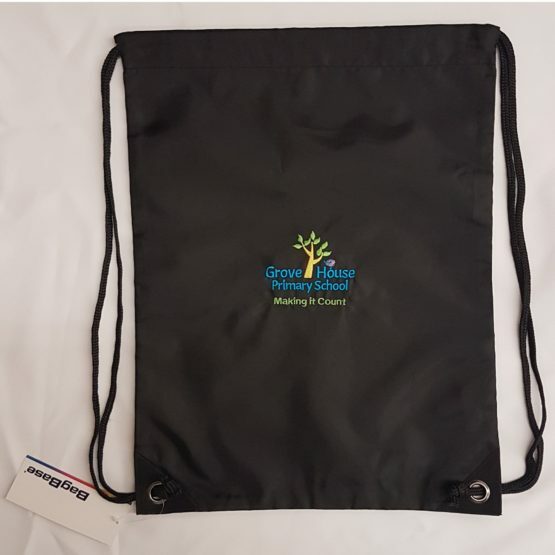 Colour :- Black, only available for Year 6. Fabric :- 65% Cotton / 35% Polyester. Washing :- 40º. Weight :- 320-340 gsm. Size age/Chest" :- 7-8/28, 9-10/30, 11-12/32, 13/34, Small/36, Medium/39, Large/43, XLarge/47. Please note that adult sizes are only suitable for young children under the age of 14 and therefore unsuitable for older people. 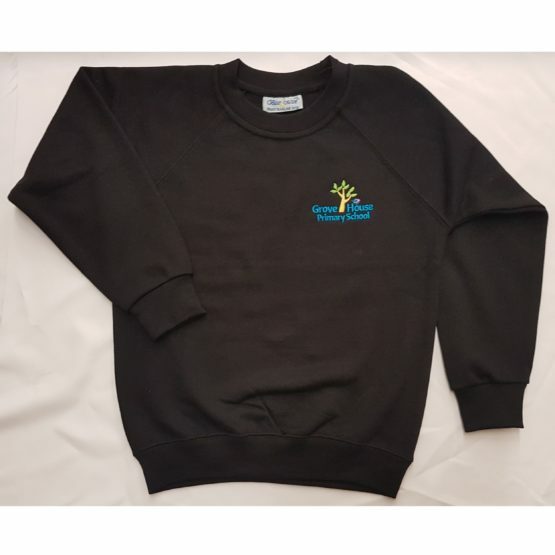 Raglan sleeve crew neck sweatshirt, ribbed welt hem and cuffs, twin needled seams, taped back neck seam and soft to handle, cotton rich durable fabric. School logo embroidered on left breast. Colour :- Black, only available for Year 6. Fabric :- 65% Cotton / 35% Polyester. Washing :- 40º. Weight :- 320-340 gsm. Size age/Chest" :- 7-8/28, 9-10/30, 11-12/32, 13/34, Small/36, Medium/39, Large/43, XLarge/47. Please note that adult sizes are only suitable for young children under the age of 14 and therefore unsuitable for older people. Enchanced-viz reflective stripes, name card holder. Rip-Strip™ closure. 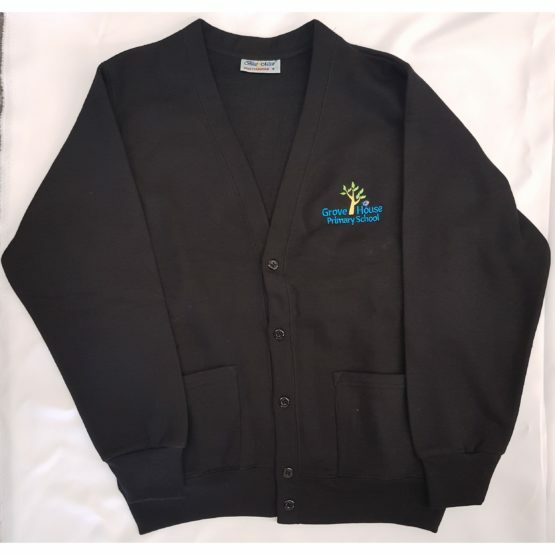 Padded handle and label on the rear.. School logo on centre front. Washing Instructions :- Sponge clean only. Dimensions :- 36 x 30 cm. Capacity :- 5 Litres. Fabric :- 600D Polyester. Weight :- 160g. Size :- One. Enhanced visibility reflective accents. External easy read name card holder. Rip-Strip™ closure. Detachable adjustable shoulder strap. Padded handle. Internal identification label. School logo on centre front. Washing Instructions :- Sponge clean only. Dimensions :- 36 x 30 x 6cm. Capacity :- 5 Litres. Fabric :- 600D Polyester. Weight :- 300g. Size :- One. Water resistant fabric. Reinforced corners with gun metal eyelets. Washing Instructions :- Sponge clean only. Dimensions :- 45 x 33cm. Capacity :- 11 Litres. Fabric :- 210D Polyester 100gsm. Weight :- 75g. Size :- One. 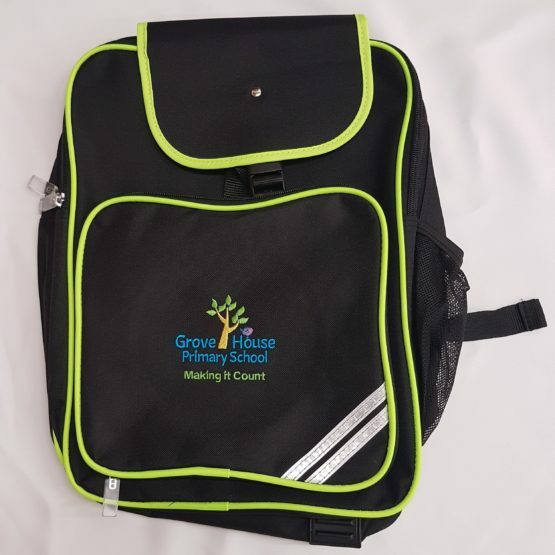 The practical junior school bag designed to carry everything a child needs for school. 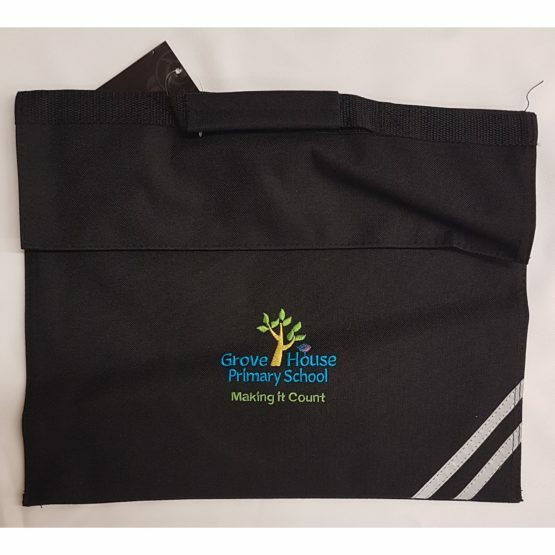 Front pocket containing pen holder and detachable pencil case. Shoulder straps have blazer buddy lining to avoid piling of garment. Special rubber feet protectors give added protection and with Hi Viz straps. Washing Instructions :- Sponge clean only. Dimensions :- 16" x 12" x 7". Fabric :- 450D. Size :- One.